The Jacksonville Jaguars football team has a soft spot in my heart. I was flying Hornets in Jacksonville during the 1996 season, the year they went to the AFC Championship game in only their second year of existence. Jacksonville fell in love with the Jaguars at first sight, and what a fun team, with Tony making huge running lanes for Natrone, and Mark throwing bombs to Jimmy and Keenan. Coach Coughlin was the stern task-master that called the shots, and the Jags owned Jacksonville. My older boys, aged 10 and 8 at the time, stood in line for a chance to have these NFL football players sign their posters or jerseys or whatever they had. The players, heads down and not saying a word, signed what was placed in their hands by the adoring and awestruck kids. No smiling, no eye-contact. I felt bad for my boys, who even at a young age could sense that these grown men wished to be someplace else and not having to deal with the rock-bottom drudgery of being a pro athlete – signing autographs for kids. I don’t think anyone asked for a snapshot, too intimidated. The only sound heard was the squeaking of their Sharpie’s as they just scribbled their names as fast as they could. The following week I took my family to NAS Cecil Field to see the Blue Angels perform at the Air Show. Over the years I’ve known many Blue Angel demo pilots and 1997 was no exception. I knew from talking to them that the demo could have had a close-call, and in the debrief there could be a frank – and I mean frank – reconstruction and personal accounting that left no doubt. Talk about putting your big-boy pants on, and rank means little or nothing. It’s six human beings who are risking their lives…no sugar-coating. But before the debrief, and there is one after each demo, they pilots go to the crowd line and sign autographs. Not only that, they interact with the crowd, thank them for coming to see them, and pose for pictures. They do that until all have a chance for an autograph, or until pulled away to debrief or get back in their jets for the flight home. The photo above is of my friend Keith Hoskins, “Judge” as we know him by, taken when he was a Blue Angel demo pilot. Look at him smiling as he hands the little boy a program, down at his level, with what I am sure is a beaming parent behind the boy. This is not unusual…all the team members interact with the crowd this way. 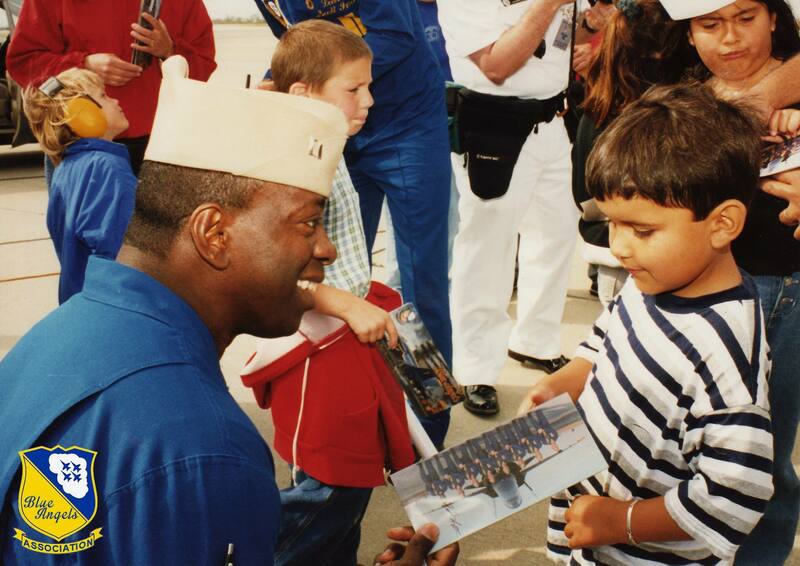 I assure you it is not an act, and despite the pressures of flying the demo, the long hours, the “commits,” the need to be “on” all the time representing the Navy and Marine Corps team, they make everyone feel special. All the guys (and gals) I’ve known on the team are great people. I’m in my second season of “boycotting” the NFL. It’s more than disgust with Kaepernick and his fellow travelers taking a knee, more than the enabling of the league that allows these guys to hurt their product on company time. It is the ungratefulness they display, their sense of entitlement, playing a game for a living with the endorsement contracts and broadcast booth careers that follow. When the Blue Angel pilots finish their tours on the team they put on a green or khaki flight suit and go back to the fleet, America’s REAL team, deployed for months at a time, away from home, and risking their lives even more than when they performed the Loop Break Cross. This stuff matters. Showing respect for the national anthem should bring us together as Americans. . Unfortunately, the disrespect trickles down. I was at a Division II football game in Pensacola over the weekend. The anthem was done with honor and the fans in this military town stood hand over hearts with respect. Scanning the sidelines, I noted that none of the players from either team were on them. Guess that’s a way for the schools to avoid even a hint of trouble vice setting a high standard for their student athletes to live up to. Is this going on elsewhere, a trend? We need men and women to lead, now more than ever, in all parts of our imperfect society.